That “fashion thing” started off on my first day at Clothing Construction-101. I was taking evening classes while still working full time at the hospital. Even though there would be long days, it didn’t matter. I was here to learn. I walked in with my professional clothes, matching heels and all my binders and folders, ready to receive the syllabus. But what came next had me second guessing this whole fashion thing… what did I just get myself into?! The class I was taking was an introduction to sewing. Here we would learn how to read a ready-made pattern and sew the garment. Believe me, I knew how to sew. That was due to my home economics class back in middle school. I could thread a sewing machine with my eyes closed, but there were students in the class who couldn’t. I had to be patient. What was interesting about taking fashion classes was not so much the classroom part, but the classroom dynamics. There were men and women of all ages. There were young students who were pursuing a fashion degree. Then there were other women, like myself, who either wanted to explore sewing as a hobby or just get out of the house and away from their families as an escape. Some women clicked instantly and would always sit together as if they have found their new best friend while others would make small talk over the sewing tables as they seam ripped an incorrect stitch and had to sew it again. If we had questions we would ask each other first rather than waiting for the instructor to make her way to every individual student. By the end of the 10 weeks I had completed a few sewing projects from various patterns. I was happy to finish my projects but I wanted to create something unique of my own. It wasn’t until I took flat pattern drafting that I designed my first original pieces! I was so proud of them that I made tags that said “BhavyJ Designs” and sewed it into the inside of the garment to act as my logo label. I submitted the designs to the annual student fashion show. This was the first time that I would be exhibiting my work to an audience. What excited me the most was to see my designs on a an actual human being rather than just a dress form.. I could see how the garment would fit on a woman’s body but also see how the garment moved. I wasn’t able to attend the show that day, but when I received the pictures there was an overwhelmingly sense of joy that came over me. A year later, I submitted another garment for the yearly student fashion show, and this time I was able to witness the model walking down the runway in my design. My friend and I cheered as the student modeled, but then I noticed something… She was wearing the skirt in the wrong direction! How could this be? My friend assured me that it was fine, and it looked great, but that didn’t matter. No one else knew, but I knew, and that was a feeling I didn’t like. For the first time, I understood how an artist or designer felt if their personal work was not showcased in the way they had envisioned it. That to me was failing as a designer. I had vowed to myself that I would never allow that to happen again. Months later, through the school newsletter, I learned of a local fabric store looking for a student intern. I thought this would be a great opportunity to gain more exposure to the fashion industry. For a few hours a week I would “observe” and try to organize the endless appliques that were strewn everywhere. There were shelves and shelves of beautiful fabrics but no organization to them. If your eye caught a fabric, you had better get it right away otherwise you may never find it again. My mentor informed me that the store would be hosting a student design competition and that I should take part. I seized the opportunity to dive into the creative process and agreed to participate. I designed a skirt with fabric chosen from the store. Flat pattern drafting and sewing techniques were now all going to be put to the test. The skirt was completed a few days before the competition. My mentor said, “This is great… but what is the model going to wear on top?” “Oh my god,” I hadn’t thought about that! I was so engrossed in perfecting the skirt that now I had to try and find a matching top? There was nothing I could find in such short notice so I decided to make a matching top. I quickly sewed it together and now had a complete outfit! I was proud of the final product and happily submitted it to the show. I attended the show with my friend and brother. As the model walked down the makeshift catwalk, I excitedly took my phone out and recorded my first show! This definitely was going on social media because I was going to broadcast it to everyone. I started to feel like a fashion designer. Even though I was so far from it, I was so excited to share this moment with everyone. A few months after the first competition, the fabric store announced their second student competition. This time there was a theme of ethnic roots. I wanted to use a traditional Indian garment and give it a contemporary twist. I asked my mother for an old sari (a six yard piece of cloth traditionally draped around the body) that was fully embroidered and transformed it into an elegant gown. I wanted to push my creativity on this piece and showcase something unique. It consisted of a corset top accompanied by a tulle and silk skirt. My father was adamant on coming to the show to show his support. I wanted to make him proud and show him that all this time that I had spent taking fashion classes was not a waste. That was more important to me than winning the competition. The show started and soon the model appeared. It was over so fast, but the minute that she was up there was the best ever. After it was over, I asked my dad how my design looked on the runway and what did he think of the others designs. He said, “I thought yours was the best and stood out from everyone!” It was the best compliment I could have gotten all day. In that moment, I knew I would always have my parents support. That’s all dad’s little girl could ask for. As I was getting close to finishing my design certificate, I knew that I wanted to pursue a career in fashion design. In particular, I wanted to create my own fashion line to sell. I started to sketch my own designs and created a portfolio in hopes of finding someone to produce them. At the time I had no idea as to how I would get there. I would Google, “How to have your designs made, How to become a fashion designer?” There was always general information but nothing useful that I could find. I signed up for any fashion forums I could find in hopes of some lead. I would have conversations with family and friends and brainstorm ideas of how to find a manufacture, what connections, if any, they might have had but nothing seemed realistic. My cousin one day mentioned a seamstress located in India and knew that her work was very good. With no leads here in the U.S., I thought let’s start with her and give it a try. I could feel the excitement stirring up inside of me! Would she be able to make my designs? Was I ready to work with a manufacturer in India now? Was she going to be the one to fulfill my dream of being a fashion designer? Was it going to be this easy? Want to know what happened next? 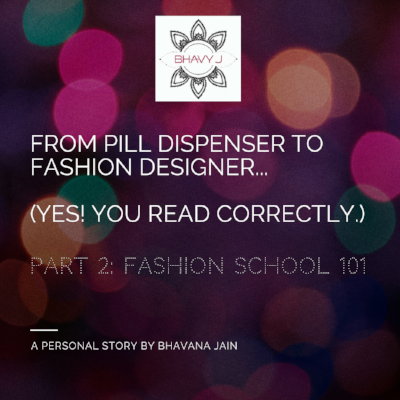 Stay tuned for next week’s installment of Pill Dispenser Turned Fashion Designer where I continue my story about my personal journey to becoming a fashion designer.